I’m feeling very proud of myself. Finally pieced this baby over the weekend while I was at the Sewtopia retreat. It’s a wedding gift for a couple who got married over a year ago. (yikes.) It’s been such a fun one to work on. The pattern is inspired by Sandy Klop’s Merry Go Round. I modified it slightly (used 2 1/4″ strips) to use the fabric a little more efficiently. I’m getting the back pieced so I can send it off to the quilter. I’ll share more photos and details when it’s all done. I think one of the funnest parts of quilting retreats (aside from being with other like-minded kindred-sewing-spirits) is seeing what everyone is working on. Here are a few projects that were on the Pellon design walls. Elizabeth Hartman patterns were popular with her Aviatrix Medallion as well as Hazel Hedgehog and Preppy the Whale patterns under way by various sewers. A few more projects going on: Sharon of Color Girl Quilts with an original pattern. Jen and Holly holding Holly’s newly finished Norway Quilt. Marci’s gorgeous quilt made from Camille Roskelly’s Hopscotch pattern made from a gorgeous assortment of Denyse Schmidt fabrics. While there, we also worked on string blocks made entirely of donated Cotton+Steel selvages. Also, there sure was a LOT of thread hanging around that room. I felt bad for whoever had to vacuum up after us. These blocks were foundation pieced on paper. (Film in the Fridge has a great strings block tutorial.) By the end of the retreat, these blocks were pieced together and will be auctioned off as a charity quilt. It was pretty cool! The sponsors of Sewtopia were very generous. I brought home a lot of loot- and I’m sharing a some of it – including a bunch more C+S selvages on my Instagram account this time. Feel free to enter there if you want a chance to win. I always bring so many projects to retreats and only finish a few. I did, however, finish this over-due Bee block for Shari in time to hand it to her in person. And to get photo-bombed by the hilarious Monica (aka Happy Zombie). 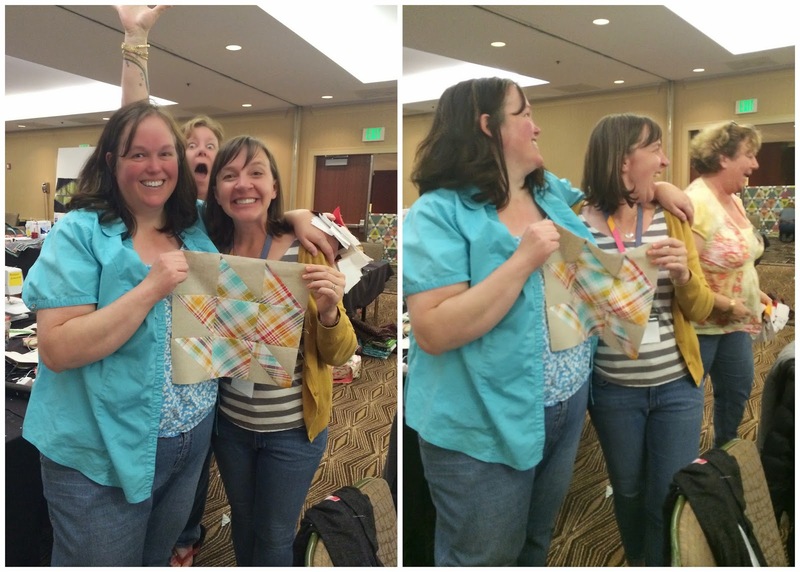 Which further proves, the funnest part of sewing retreats are the people who are there. If you want to attend a future retreat, check out the Sewtopia site. The Chicago event this spring is sold out (but has a waiting list) and they just announced the event next fall will be in Portland, OR! Details to come. Looks like a good time was had by all. What&#39;s is the name of the pattern Tammy completed? Isn&#39;t it great? I don&#39;t know what it&#39;s called – I should have asked. I&#39;ll try and track her down. You guys are too cute. What was going on in that last picture — inquiring minds want to know!!!! looks like you had a blast! 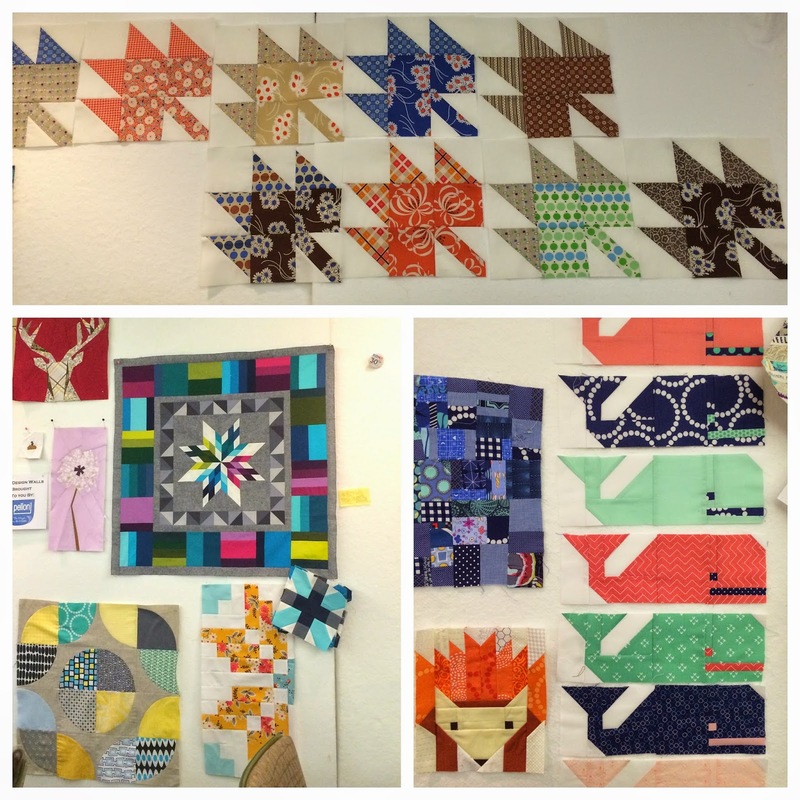 I wish we had a Sewtopia in Houston….. Yes! Houston has lots of quilters, and we love to welcome quilters from afar, too! Looks like a good time was had by all!!!!! Looks like a fun time! Your quilt top is gorgeous! Hi ya you photo posing goober! :) Always the ham!! xo Love the quilt you &quot;finally&quot; finished!! what a fantastic weekend! it was so much fun to visit with you again. thanks for the shout-out! It&#39;s fun to see all the projects: you were better about taking pictures than I was. Wow what amazing work you all did! Love your photos, as usual! That snowflake quilt is amazing! Do you do the string blocks on paper foundation? What a good idea. Yes! The paper makes it so much easier. I just added a link in the post to a tutorial from Ashley at Film in the Fridge. Looks like lots of fun! Next year it&#39;s going to be here in Portland ~ I&#39;m going!!! It looks like a good time was had by all. I am glad to see that it only takes a little dedicated time to complete the quilt that Tammy made. The pattern is on my list of quilts to make. Just google Astrodelic quilt pattern and look for the free pdf from Art Gallery. I cannot get the link to paste correctly. Thank you so much! I added the link to the PDF in the post. What a great pattern. And yes, she whipped it up fast. Great post! I was too busy having fun to remember to take any pictures. In fact you took a much better picture of my quilt than I did! So fun to see you!! That is so awesome!! I really want to go – I&#39;d love to attend the Portland one! I&#39;ll have to keep an eye out for those details.